Augmentin is a combination drug that contains amoxicillin and clavulanate and is used to treat numerous bacterial infections in the body’s tissues and bloodstream. Amoxicillin is a penicillin-based drug that fights infection; clavulanic acid is added to the preparation in order to boost the drug’s effectiveness against penicillin-resistant bacteria. 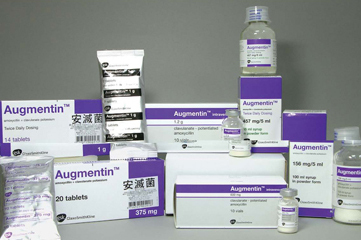 Augmentin is primarily used in both children and adults to treat ear infections, some forms of throat infections, pneumonia, sinusitis and bronchitis. The medication is also used to treat skin infections that may result from wounds as well as common folliculitis. It is available in a wide range of preparations that are well-suited for both children and adults. Children are often familiar with the pleasant-tasting oral suspension, but older children and adults have the option to take extended-release tablets or even chewable tablets, if the need is present. Amoxicillin is the number one medication used to treat stomach ulcers caused by the bacteria H. pylori and prevent their return; the dosage for this and other illnesses is determined by the illness itself as well as its severity. Avelox is the generic name for the drug Moxifloxacin and is an oral prescription antibiotic which is recommended for treatment of various bacterial infections. Cipro is a brand name of the generic drug ciprofloxacin and is a prescription antibiotic medication used to treat a variety of infections. Sulfamethoxazole & Trimethoprim. Bactrim is a very effective antibiotic against specific conditions such as UTIs, ear infections, bronchitis and acne. Maalox is a brand name antacid that contains magnesium hydroxide and aluminum hydroxide. A combination of these two ingredients works to reduce or neutralize stomach acid. Amoxicillin is a prescription antibiotic and is most commonly marketed under the brand name Amoxil. Other brand names include Biomox, DisperMox, Moxatag and Trimox.